... a celebration because it was anyone's guess whether or not this would happen! The space is complete, and let me just say, WHEW, and I LOVE it. You may remember last ORC I had some problems with a contractor and was convinced there was no way everything could come together in time. These projects are part of a ranch house renovation, and require lots more than new paint and fabrics which has been quite a challenge (pun intended) for me as I've no experience in the remodeling arena. Some of the people I've worked with are fantastic, while others don't care a bit that there's a deadline. But, we're looking forward instead of back because just look at that countertop : ). I’m throwing a party to celebrate because I could NOT be happier with this space. My family room/breakfast room/kitchen started out as a family room, a breakfast room, and a kitchen. To catch up, here's Week One, Week Two, Week Three, Week Four, Week Five, and Week Six. I knew when I bought this house that the main challenge would be brightening up what was previously more or less a dark, dreary cave. Opening up these rooms was effective not only in lightening, but also in creating a much more pleasant space. I'm not at all a fan of a complete open floor plan, but I do like the kitchen and breakfast room open to the family room. It's nice to have everyone more accessible in these rooms where we spend so much time. I've been saved from potential Seasonal Affective Disorder by the Velux Skylights. Seriously, I wouldn't last a week in Seattle -- even the talent at Seattle Grace couldn't save me from the consequences of living in the dark. Go here to read what I learned about how living in a dark environment effects your mood and health and how I decided to have Velux skylights installed. The level of natural light this space is now receiving is amazing and so very welcome. The skylights are energy efficient, leak-proof, and require no maintenance, so they’re basically magic (not to mention the super fancy tricked out remote control that comes with them). So many ranch houses are darker than what people want now, and the addition of skylights is the most effective way to address that issue. The other element used to combat the cave-like area was Farrow & Ball’s “All White” paint. It’s such high-quality paint and, in my opinion, the most attractive shade of white available. It elevated the walls and took my project from darkness to light. I already used this paint here, and plan to use it all over the house. Before I could move on to decorating, though, there were still a few structural elements that needed to be addressed. The sliding glass door and windows topped the list being very outdated and unattractive. This image was taken in the family room post hardwoods installation (you can read about that here), but before anything else was done. You can see the old windows and paneling that had to go. Luckily, Milgard came to my rescue with super minimal, clean, low maintenance vinyl windows and a sliding door (see image below). I went to their plant and showroom here in the Dallas area, and was impressed with both their products and their service. You can read more about the door and windows here. Next was the issue of the moulding, which was VERY easy to solve. Since I’d already established my love for Metrie’s products and amazing customer service, I of course, went straight to them, and they delivered. Below is an image that shows the Milgard windows on the left, with the sliding door on the right. The combination of the Milgard products with the Metrie moulding is exactly what I was hoping for. The Farrow and Ball All White is in the Modern Emulsion finish, and the walls, ceiling, and moulding were all painted with this paint. I love the soft, clean look of using one color and one finish everywhere. The last thing I addressed was the light switches and outlets—a seemingly minor detail that actually makes a huge difference in a room, as I’ve learned. I replaced my old light switches and outlet covers (which were also from the late 60’s and not in a good way) with new ones from the Legrand Adorne series from Bellacor, and they’re simply amazing. Read more about the electrical update here. There's a switch on the wall just to the left of the window in the photo above. See how unobtrusive it looks? Love that. And, below, you can see where turn on and off all the lights in the kitchen, breakfast and family rooms. I wanted the family room's style to be cohesive with the formals area I completed for the last One Room Challenge™, but more casual. Aesthetics vs. practicality came into play significantly since this is the room where my teenage daughter, my 5 pound Maltipoo who think's she's one of us, and I will likely be spending a good amount of time, and I was able to find a very happy balance between the two. This jute rug from Annie Selke helps to set the tone. In my opinion, you can’t go wrong with this style -- it’s chic, and works with everything. This fantastic coffee table from The Mine helps create the sunroom vibe I was after. I’m especially excited by its size—lots of room for books. I recovered my sofa with Stroheim's Crypton Home Dearing fabric in Alabaster from the Dana Gibson Collection. I love a white sofa, and this ultra-durable fabric allows me to follow my dreams and enjoy it it worry free. For the club chairs, I used Fabricut’s Pier Stripe fabric from the Kendall Wilkinson Collection, which adds a fresh, fun, timeless look. It's a Sunbrella fabric, so all of the seating in the family room is upholstered with performance fabrics. Even the light blue welting and stripe on the bottom of the sofa's skirt is Stroheim's Outdoors 23. These performance fabrics aren't in any way a compromise. They're as gorgeous as you could ever want, and feel soft and comfy as well. Above the mantle is an absolutely GORGEOUS Christina Baker painting — I’m obsessed with her work, and you'll see more when we get to the breakfast area. This painting perfectly captures what I wanted to bring into this room. The colors and composition are both stunning, and I’m just really in awe. Flanking the painting are these green reproduction majolica plates, which displayed this way add a bit of the unexpected while not taking away from the incredible artwork. The recessed lighting is from Lamps Plus. I wasn't sure exactly what I needed, and they were very helpful. The previous can lights were obtrusive black and brass circles on the ceiling, and now the lighting blends nicely with the ceiling, hardly showing at all which is so much nicer. Moving into the breakfast room, I began the transformation by adding a banquette. You may recognize this table from my last ORC—I’ve actually moved it into this space because it couldn't be more perfect for this area, but also because I like it so much I wanted in the space where I’d spend the most time. On either side of the banquette are original paper pieces from Christina Baker’s new series, “Convergence.” I truly cannot get over these paintings - Christina is SO talented. A limited number of her paintings on paper from this series are now available in my store—click here to see. This photo shows what Christina's paper pieces do for the space. I adore classic American style -- traditional -- but updated and fresh. Christina's art brings in the "update" that balances with all of the traditional. In this space, the table also helps toward that balance. Also, on the walls are these amazing swing arm lamps from Bellacor. And, of course, my breakfast room wouldn’t be complete without the fantastic custom Colleen and Company pagoda lantern which was designed for this past ORC project. As this current ORC became such a down to the wire situation, I realized it was time to delegate and enlisted the help of the amazing Susan Palma who is both co-author of Sophistication is Overrated and one of my very favorite interiors designers ever. She styled my breakfast table, and it absolutely couldn't be more perfect! This buffet area was built across from the banquette, and I couldn’t be more pleased with what it adds to the space. It creates cohesion between the banquette and the kitchen while providing lots of extra storage, and the perfect place to set out refreshments. I used the same wallcovering from Stroheim that's in my entry. Using an existing element again somewhere else is a great way to provide cohesiveness. But, also, I just love this paper -- the texture is amazing (see detail image below). The centerpiece is this gorgeous, fun mirror from Bassett Mirror Company. 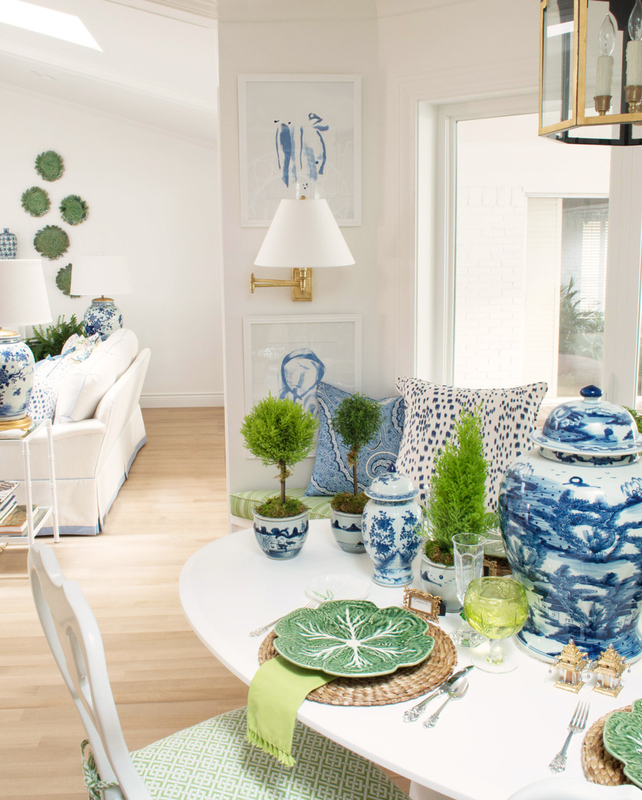 All of the blue and white on the table as well as the built-in is available here. The Schaub and Company pulls update the traditional style cabinetry beautifully. I can't imagine finding hardware I like better than their City Lights Collection (detail image below). Now for the kitchen, which was definitely the hardest part of the project for me. In every house in which I've lived, I’ve always worked with the existing kitchen, making only small tweaks like painting the cabinets or installing new appliances. With this kitchen, however, it made no sense to invest anything into what was there. There was rust colored floral wallpaper, the sink was on a diagonal peninsula, the appliances were black and unusually sized, the cabinetry was darkly stained oak with lots of grain, the flooring was vinyl, and, well, you understand. So, I ended up having to completely start over. We ripped everything out, and adjusted the floor plan by getting rid of the diagonal peninsula, relocating the garage door from the kitchen to a tiny mud room/hallway that was created by taking in part of the oversized laundry room, and were also able to add a pantry. Starting with the cabinets, I decided to work with cliqstudios.com after thorough research. I was paired with a kitchen designer who drew up elevations based on my vision. The cabinets arrived ready to be installed, and you can see them below. There was a lot of time and thought put into the cabinets as they're a hugely important part of the kitchen. Their quality, style and design will very much impact my use and enjoyment of my kitchen, and will also impact the future sale of my house. So far, I'm very happy with my cabinet choice. Friends who have come in have been impressed by the way they open and close, and their quality in general. I'll be adding all this and much more to my renovation page as I know there's lots of interest in learning about online cabinet shopping. You can read more about my experience with cliqstudios here. I’m all about not sacrificing aesthetics for durability, so Silestone is perfect for me. The combination of natural quartz and other resilient raw materials makes for a gorgeous surface that's highly resistant to the staining coffee, wine, lemon juice, olive oil, vinegar, and many other everyday products can cause. Basically, it's the dream. Their Calcutta Gold in the Suede finish it what I used, and it's just spectacular. I appreciate Shay, from IBB Design, very much for recommending that I use Moreno Granite for the fabrication and installation. I couldn't be more impressed with the quality of their work. And, oh my, these knobs. I could barely contain my excitement watching them be installed, which was probably highly amusing to my handymen. They're spectacular next to the Bertazzoni range, which, by the way, is quite possibly the most gorgeous appliance I’ve ever seen. All of the Bertazzoni ranges are so beautifully designed, but I fell hard for the Heritage Series range in black. At this point, I'm still remodeling this house and my primary source of food is Eatzi's. I can't wait to actually start using this range, and I'll definitely share my experience. Having glass front cabinets is a first for me, and I had to decide what I'd use in them. Their placement requires that they be functional, so I combined some brand new everyday dinnerware with vintage blue hobnail glassware. Across the way from my range is the sink. This faucet, made by Hansgrohe, is incredible and fits in with the room’s other elements perfectly. I'd heard and read so many positive things about Hansgrohe products that I took a chance and ordered this faucet without having seen it in person. The image online was GORGEOUS, but actually doesn't do it justice. It's a beautifully designed fixture, and it's quality is very obvious when you use it. On the opposite side of the counter, I added these acrylic barstools from Wisteria. The pendant lights hanging above them are from Craftmade. Both of these elements were chosen to help add a more updated feel to the traditional style of the space, and I absolutely love what they add here. I ordered the Craftmade Piltz Pendants because I think they're gorgeous, and also because they don't look like so many of the options I see as I scroll through Pinterest. When the electrician started to install them, I thought there might be just a bit more brass than what would be optimal in my kitchen. I really like the design of these fixtures and wasn't going to be deterred. Susie, from Maddie G Designs, sent me to Ivan, from IBM Upholstery here in Dallas, who did all of the upholstery for my project, and he painted the pendants for me as well. I love how they look with the white -- just imagine the possibilities! We all love a good before and after, so I'll leave you with this. It's hard to imagine the room below looked like the top image only a couple of months ago. Many elements created this transformation, but the most impactful of all, as I'm sure you can see, were the skylights. And, we're so happy to have all this light that allows us to see each other and our new space : ).